So I have a bit of a weird fetish. I’m always interested in experimenting with different diets. Mainly because I’m curious to understand how changing what I eat changes the way I feel. But also because I want to understand what it’s like for people with allergies who have no choice in the matter. When Fergal was first born, like most new mothers I was super vigilant in observing his every move. So when I noticed he was having a bit of reflux, I did some research. One suggested solution was to try eliminating dairy from the mothers diet. So I decided to have ‘dairy-free week’. Finely grating Brazil nuts with a microplane has been my ‘go-to’ dairy-free option for ages. While it looks the part, the flavour isn’t as good as real parmesan. But recently I’ve discovered an alternative. See below for the recipe! Desserts are easily the most difficult area to go dairy free. My favourite whipped cream alternative is to chill a can of coconut cream (the higher the fat content the better) then spoon the solid cream into a bowl and leave any watery liquid in the can. Whisk until thick just like regular whipping cream. Where you have a cheese being used as a flavour highlight, for example in a salad of roast beets and goats cheese, roasted pinenuts or other nuts can work as a replacement by providing richness and visual interest. You need a super high-powered blender for this to work. Soak cashews in water for a few hours, then drain and keep the soaking water. Whizz cashews in your blender adding in a little water as you go. Add lemon juice until you’re happy with the taste and keep adding water until you’re happy with the consistency. You can use a food processor but it won’t end up as creamy. Or see this cashew sauce recipe. See the Cashew Ricotta recipe over here. See the recipe over here. Home made almond milk is easy and really delicious. But it’s a bit too time consuming for me on an everyday basis. I recently made a butter chicken (aka chicken tikka marsala). The recipe called for cashew butter to finish the sauce. It was amazing the difference the cashew butter made to the curry adding lovely nutty complexity. So I’m planning on experimenting with using other nut butters in sauces. Think sate and beyond. My supermarket stocks cashew, peanut, and almond butters in the health food section. All are worth playing with. It’s hard to go past real butter in baked goods. The next best option is coconut oil or copha. But these make everything taste coconutty so be warned! UPDATE: thanks to QB for alerting me to the fact that copha is hydrogenated and actually not a healthy choice. Stick to coconut oil please! When a coconutty flavour isn’t an option just sub in a neutral flavoured oil like rice bran oil or peanut oil. If the recipe instructs you to cream butter and sugar the oil won’t cream up and trap as much air as butter would. So add a little extra baking powder to make up for it. 1/2 teaspoon should do in most cases. Most dairy dietary problems are a reaction to the sugars or proteins in milk products. Clarified butter or ghee has had these removed so can be fine for most allergy situations. To make your own just melt butter in a saucepan. Skim off and remove any white foam from the top. Keep the lovely buttery oil in the middle and discard the white solids from the bottom. This also makes the ghee or butter oil more stable so great for cooking at higher temps. My go to ice cream replacement. When I used to have an ice cream maker I would just churn a can of coconut cream with a little icing sugar for sweetness. However these days my favourite Coconut Sorbet doesn’t require an ice cream machine or added sugar. Win win! nut-free – use real parmesan :) or try with sunflower seeds. Different nuts – also great with pine nuts or almonds or cashews. I do think it makes total sense to try out different diets every once in a while… I recently did a month of paleo… It’s a hot thing at the moment and I was curious to see how it would’ve and how it would feel… Not having cheese for a month that is… I actually loved it, although I couldn’t do it always, but had I known some of your tips, it would have been easier! Jules, this is a great list and I’m looking forward to trying out all these ideas! With one exception: I recently learned that Brazil nuts are probably the most radioactive food you can eat. We live in BC, on the shores of the Pacific Ocean, right across from Japan. With all the atmospheric radiation that has been released from Fukishima having come our way (as well as the hundreds of tons of radioactive water they’ve been dumping daily into the ocean), we are very concerned, and trying to figure out ways to reconfigure our diet and eat lower on the food chain – Pacific fish, meat and dairy are likely the most contaminated. I’ve been a semi-vegetarian for decades (eating fish and occasional poultry) but now I’m looking more and more at vegan foods. I am trying to think of (for example) decent substitute for anchovies and other tasty staples. Your article is therefore very timely and helpful. I’m wondering what you think might be the next best nut to use for “parmesan”, rather than Brazil nuts? Love your blog, BTW. I wasn’t aware… I should have said in the recipe that most nuts would be great esp almonds and pine nuts. Thanks for this tip, Jules – I’ll give almonds a try (pine nuts being too pricey for my liking!). Some really interesting ideas here, Jules. I have a number of friends who are lactose intolerant and have shared this article with them, in the hope that it provides them with many more options. I developed a dairy intolerance after the birth of my second niblet (my dietitian believes it could be a temporary thing, here’s hoping!). While I’m not missing the milk part of it too much, saying goodbye to cheese has been super sucky. I love coming across ideas like these for alternatives to help me along the way. 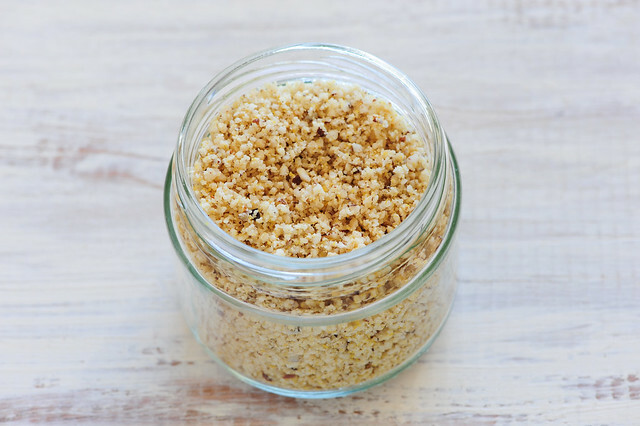 The Brazil Nut Parmesan sounds awesome, will definitely be trying it. Ahh!! You did not seriously suggest copha!? It might be derived from coconut but it is hydrogenated and therefore a transfat! Stick to pure coconut oil. Thanks for the heads up QB I didn’t realise copha was hydrogenated… will update my post ASAP! Great post, and good for you for trying. My son has a dairy allergy so we have had to eliminate all dairy from our house. It was difficult at first but we learned to get used to it. We definitely incorporated a lot of the tips that you mentioned. One thing that we do quite frequently is to make our own milk. We typically make almond milk and it surprisingly easy to make. Thanks for sharing! What a great post. I’m always looking for good alternates to dairy. Very helpful. I love adding a little nutritional yeast to dishes for that “cheesy” flavor. That parmesan looks like a great topping to have on hand, thanks for sharing! My daughter has a dairy allergy, and also a nut allergy. Like you mentioned, desserts are the most difficult to get around so she doesn’t feel left out. Also, as an 11 yr. old, she has recently developed a strong interest in baking her own desserts. Thank you for the coconut whipped cream substitute. She is not allergic to that and we can’t wait to try it! I want to try the recipe – looks good. We love to sprinkle nutritional yeast on popcorn with salt, but that’s about all I do with it. I tried cashew cream one time out of curiosity – we didn’t care for it at all.